Beat the egg and milk together. Have the breadcrumbs in a plate next to the egg mixture and work like an assembly line. 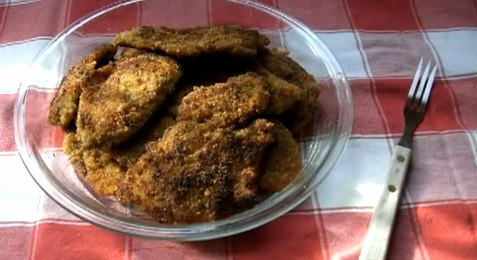 Dip the cutlet first in the breadcrumbs, then in the egg mixture, then back in the breadcrumbs until fully coated. Repeat until all are finished. Heat the olive oil over medium to high heat. You’ll have to adjust the heat – it’s a “feel” things – you can tell if they are browning too slowly or too quickly. Fry until golden, transfer to an oven-proof dish. I put them in a 200-degree oven to keep them crispy until they are all done. Enjoy! Arrange bread in a single layer on a baking sheet. Bake for 20 minutes, until the bread is crisp and dry. Allow to cool completely, then break into small pieces. Place in food processor and add seasonings. For gluten-free breadcrumbs, substitute 1 cup brown rice flour and 1 cup cornmeal for the stale bread. Quite possibly my most FAVORITE food in the universe! My most treasured personal heirloom recipe for breaded chicken cutlets. It's versatile directions allow you to apply the breading process to anything from turkey to eggplant, and can be served gluten free. Great for dinner and they make up nicely in sandwiches the next day. Do this ahead and refrigerate. It allows the batter to set up and makes the pan-frying easier. If you don’t have time, not to worry – it still comes out perfectly.